Casts input pixels to output pixel type. This filter is templated over the input image type and the output image type. CastImageFilter allows the input and output image to be different dimensions. This is useful if you want to cast an 2D image to 3D image. The resulting 3D image will have a single slice. If you attempt to cast an image to a lower dimension, the first "slice" (or line or volume) will be extracted. If you want to convert an image to a lower dimension and specify the subspace (i.e. which slice of a volume, etc.) then you should use ExtractImageFilter. Definition at line 69 of file itkCastImageFilter.h. Reimplemented from itk::UnaryFunctorImageFilter< TInputImage, TOutputImage, TFunction >. Definition at line 85 of file itkCastImageFilter.h. Smart Pointer type to a DataObject. Reimplemented in itk::LabelStatisticsImageFilter< TInputImage, TLabelImage >, itk::MinimumMaximumImageFilter< TInputImage >, itk::StatisticsImageFilter< TInputImage >, and itk::StreamingImageFilter< TInputImage, TOutputImage >. Definition at line 62 of file itkImageSource.h. Definition at line 103 of file itkProcessObject.h. Definition at line 112 of file itkProcessObject.h. Reimplemented in itk::AdaptImageFilter< TInputImage, TOutputImage, TAccessor >, and itk::SymmetricEigenAnalysisImageFilter< TInputImage, TOutputImage >. Definition at line 56 of file itkUnaryFunctorImageFilter.h. Definition at line 84 of file itkInPlaceImageFilter.h. Reimplemented from itk::InPlaceImageFilter< TInputImage, TOutputImage >. Definition at line 64 of file itkUnaryFunctorImageFilter.h. Reimplemented in itk::VectorRescaleIntensityImageFilter< TInputImage, TOutputImage >. Definition at line 62 of file itkUnaryFunctorImageFilter.h. Definition at line 63 of file itkUnaryFunctorImageFilter.h. Definition at line 61 of file itkUnaryFunctorImageFilter.h. Typedef for the region copier function object that converts an input region to an output region. Definition at line 164 of file itkImageToImageFilter.h. Definition at line 69 of file itkUnaryFunctorImageFilter.h. Definition at line 67 of file itkUnaryFunctorImageFilter.h. Definition at line 68 of file itkUnaryFunctorImageFilter.h. Reimplemented in itk::SymmetricEigenAnalysisImageFilter< TInputImage, TOutputImage >, itk::TensorFractionalAnisotropyImageFilter< TInputImage, TOutputImage >, itk::TensorRelativeAnisotropyImageFilter< TInputImage, TOutputImage >, and itk::LabelToRGBImageFilter< TLabelImage, TOutputImage >. Definition at line 66 of file itkUnaryFunctorImageFilter.h. Typedef for the region copier function object that converts an output region to an input region. Definition at line 169 of file itkImageToImageFilter.h. Definition at line 84 of file itkCastImageFilter.h. Definition at line 78 of file itkCastImageFilter.h. Definition at line 83 of file itkCastImageFilter.h. Definition at line 103 of file itkCastImageFilter.h. Definition at line 104 of file itkCastImageFilter.h. If an imaging filter needs to perform processing after all processing threads have completed, the filter can can provide an implementation for AfterThreadedGenerateData(). The execution flow in the default GenerateData() method will be: 1) Allocate the output buffer 2) Call BeforeThreadedGenerateData() 3) Spawn threads, calling ThreadedGenerateData() in each thread. 4) Call AfterThreadedGenerateData() Note that this flow of control is only available if a filter provides a ThreadedGenerateData() method and NOT a GenerateData() method. 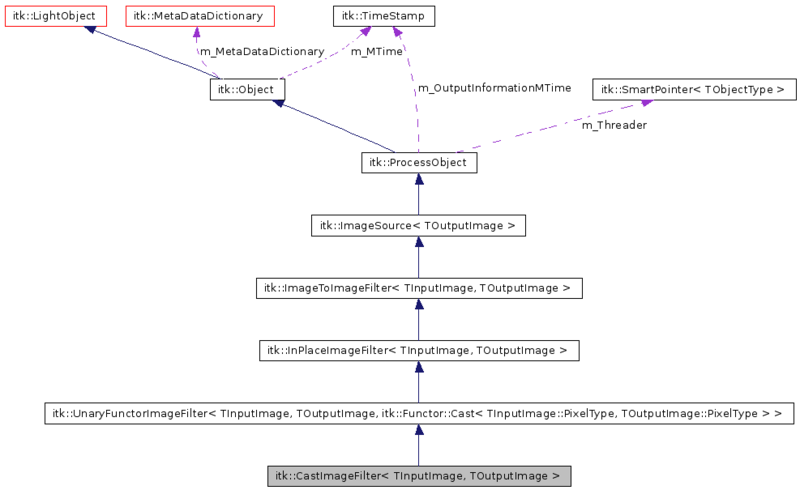 Reimplemented in itk::HistogramMatchingImageFilter< TInputImage, TOutputImage, THistogramMeasurement >, itk::ConnectedComponentImageFilter< TInputImage, TOutputImage, TMaskImage >, itk::ContourDirectedMeanDistanceImageFilter< TInputImage1, TInputImage2 >, itk::DirectedHausdorffDistanceImageFilter< TInputImage1, TInputImage2 >, itk::InterpolateImageFilter< TInputImage, TOutputImage >, itk::LabelStatisticsImageFilter< TInputImage, TLabelImage >, itk::MinimumMaximumImageFilter< TInputImage >, itk::ResampleImageFilter< TInputImage, TOutputImage, TInterpolatorPrecisionType >, itk::ShiftScaleImageFilter< TInputImage, TOutputImage >, itk::ShiftScaleInPlaceImageFilter< TInputImage >, itk::SimilarityIndexImageFilter< TInputImage1, TInputImage2 >, itk::StatisticsImageFilter< TInputImage >, itk::VectorResampleImageFilter< TInputImage, TOutputImage, TInterpolatorPrecisionType >, itk::VotingBinaryHoleFillingImageFilter< TInputImage, TOutputImage >, itk::WarpImageFilter< TInputImage, TOutputImage, TDeformationField >, itk::DifferenceImageFilter< TInputImage, TOutputImage >, and itk::ResampleImageFilter< TInputImage, TOutputImage, TInterpolatorPrecisionType >. Definition at line 254 of file itkImageSource.h. The GenerateData method normally allocates the buffers for all of the outputs of a filter. Since InPlaceImageFilter's can use an overwritten version of the input for its output, the output buffer should not be allocated. When possible, we graft the input to the filter to the output. If an InPlaceFilter has multiple outputs, then it would need to override this method to graft one of its outputs and allocate the remaining. If a filter is threaded (i.e. it provides an implementation of ThreadedGenerateData()), this method is called automatically. If an InPlaceFilter is not threaded (i.e. it provides an implementation of GenerateData()), then this method (or equivalent) must be called in GenerateData(). If an imaging filter needs to perform processing after the buffer has been allocated but before threads are spawned, the filter can can provide an implementation for BeforeThreadedGenerateData(). The execution flow in the default GenerateData() method will be: 1) Allocate the output buffer 2) Call BeforeThreadedGenerateData() 3) Spawn threads, calling ThreadedGenerateData() in each thread. 4) Call AfterThreadedGenerateData() Note that this flow of control is only available if a filter provides a ThreadedGenerateData() method and NOT a GenerateData() method. Reimplemented in itk::HistogramMatchingImageFilter< TInputImage, TOutputImage, THistogramMeasurement >, itk::IsoContourDistanceImageFilter< TInputImage, TOutputImage >, itk::LabelVotingImageFilter< TInputImage, TOutputImage >, itk::BilateralImageFilter< TInputImage, TOutputImage >, itk::BinaryThresholdImageFilter< TInputImage, TOutputImage >, itk::ConnectedComponentImageFilter< TInputImage, TOutputImage, TMaskImage >, itk::ContourDirectedMeanDistanceImageFilter< TInputImage1, TInputImage2 >, itk::DiffusionTensor3DReconstructionImageFilter< TReferenceImagePixelType, TGradientImagePixelType, TTensorPixelType >, itk::DirectedHausdorffDistanceImageFilter< TInputImage1, TInputImage2 >, itk::DisplacementFieldJacobianDeterminantFilter< TInputImage, TRealType, TOutputImage >, itk::ExpandImageFilter< TInputImage, TOutputImage >, itk::ImageToVectorImageFilter< TInputImage >, itk::IntensityWindowingImageFilter< TInputImage, TOutputImage >, itk::InterpolateImageFilter< TInputImage, TOutputImage >, itk::InterpolateImagePointsFilter< TInputImage, TOutputImage, TCoordType, InterpolatorType >, itk::InvertIntensityImageFilter< TInputImage, TOutputImage >, itk::LabelStatisticsImageFilter< TInputImage, TLabelImage >, itk::MinimumMaximumImageFilter< TInputImage >, itk::ModulusImageFilter< TInputImage, TOutputImage >, itk::ObjectMorphologyImageFilter< TInputImage, TOutputImage, TKernel >, itk::RecursiveSeparableImageFilter< TInputImage, TOutputImage >, itk::ResampleImageFilter< TInputImage, TOutputImage, TInterpolatorPrecisionType >, itk::RescaleIntensityImageFilter< TInputImage, TOutputImage >, itk::ShiftScaleImageFilter< TInputImage, TOutputImage >, itk::ShiftScaleInPlaceImageFilter< TInputImage >, itk::SimilarityIndexImageFilter< TInputImage1, TInputImage2 >, itk::StatisticsImageFilter< TInputImage >, itk::TernaryFunctorImageFilter< TInputImage1, TInputImage2, TInputImage3, TOutputImage, TFunction >, itk::ThresholdLabelerImageFilter< TInputImage, TOutputImage >, itk::VectorExpandImageFilter< TInputImage, TOutputImage >, itk::VectorGradientMagnitudeImageFilter< TInputImage, TRealType, TOutputImage >, itk::VectorIndexSelectionCastImageFilter< TInputImage, TOutputImage >, itk::VectorResampleImageFilter< TInputImage, TOutputImage, TInterpolatorPrecisionType >, itk::VectorRescaleIntensityImageFilter< TInputImage, TOutputImage >, itk::VotingBinaryHoleFillingImageFilter< TInputImage, TOutputImage >, itk::WarpImageFilter< TInputImage, TOutputImage, TDeformationField >, itk::WarpVectorImageFilter< TInputImage, TOutputImage, TDeformationField >, itk::DifferenceImageFilter< TInputImage, TOutputImage >, itk::LabelOverlayImageFilter< TInputImage, TLabelImage, TOutputImage >, itk::LabelToRGBImageFilter< TLabelImage, TOutputImage >, itk::ResampleImageFilter< TInputImage, TOutputImage, TInterpolatorPrecisionType >, itk::TransformToDeformationFieldSource< TOutputImage, TTransformPrecisionType >, itk::TernaryFunctorImageFilter< TInputImage, TInputImage, TInputImage, TOutputImage, itk::Function::Compose3DVector< TInputImage::PixelType > >, itk::TernaryFunctorImageFilter< TInputImage1, TInputImage2, TInputImage3, TOutputImage, itk::Function::Modulus3< TInputImage1::PixelType, TInputImage2::PixelType, TInputImage3::PixelType, TOutputImage::PixelType > >, itk::TernaryFunctorImageFilter< TInputImage1, TInputImage2, TInputImage3, TOutputImage, itk::Function::ModulusSquare3< TInputImage1::PixelType, TInputImage2::PixelType, TInputImage3::PixelType, TOutputImage::PixelType > >, itk::TernaryFunctorImageFilter< TInputImage1, TInputImage2, TInputImage3, TOutputImage, itk::Function::Add3< TInputImage1::PixelType, TInputImage2::PixelType, TInputImage3::PixelType, TOutputImage::PixelType > >, itk::TernaryFunctorImageFilter< TInputImage, TInputImage, TInputImage, TOutputImage, itk::Function::Compose3DCovariantVector< TInputImage::PixelType > >, and itk::TernaryFunctorImageFilter< TInputImage, TInputImage, TInputImage, TOutputImage, itk::Function::ComposeRGB< TInputImage::PixelType > >. Definition at line 242 of file itkImageSource.h. Cache the state of any ReleaseDataFlag's on the inputs. While the filter is executing, we need to set the ReleaseDataFlag's on the inputs to false in case the current filter is implemented using a mini-pipeline (which will try to release the inputs). After the filter finishes, we restore the state of the ReleaseDataFlag's before the call to ReleaseInputs(). This function calls the actual region copier to do the mapping from input image space to output image space. It uses a Function object used for dispatching to various routines to copy an input region (start index and size) to an output region. For most filters, this is a trivial copy because most filters require the input dimension to match the output dimension. However, some filters like itk::UnaryFunctorImageFilter can support output images of a higher dimension that the input. This function object is used by the default implementation of GenerateOutputInformation(). It can also be used in routines like ThreadedGenerateData() where a filter may need to map an input region to an output region. The default copier uses a "dispatch pattern" to call one of three overloaded functions depending on whether the input and output images are the same dimension, the input is a higher dimension that the output, or the input is of a lower dimension than the output. The use of an overloaded function is required for proper compilation of the various cases. For the latter two cases, trivial implementations are used. If the input image is a higher dimension than the output, the first portion of the input region is copied to the output region. If the input region is a lower dimension than the output, the input region information is copied into the first portion of the output region and the rest of the output region is set to zero. If a filter needs a different default behavior, it can override this method. This function calls the actual region copier to do the mapping from output image space to input image space. It uses a Function object used for dispatching to various routines to copy an output region (start index and size) to an input region. For most filters, this is a trivial copy because most filters require the input dimension to match the output dimension. However, some filters like itk::ExtractImageFilter can support output images of a lower dimension that the input. This function object can be used by GenerateOutputInformation() to copy the input LargestPossibleRegion to the output LargestPossibleRegion and can also be used in GenerateData or ThreadedGenerateData() where a filter may need to map an output region to an input region. For the latter two cases, trivial implementations are used. If the input image is a higher dimension than the output, the output region information is copied into the first portion of the input region and the rest of the input region is set to zero. If the input region is a lower dimension than the output, the first portion of the output region is copied to the input region. If a filter needs a different default behavior, it can override this method. The ExtractImageFilter overrides this function object so that if the input image is a higher dimension than the output image, the filter can control "where" in the input image the output subimage is extracted (as opposed to mapping to first few dimensions of the input). Can the filter run in place? To do so, the filter's first input and output must have the same dimension and pixel type. This method can be used in conjunction with the InPlace ivar to determine whether a particular use of the filter is really running in place. Some filters may be able to optimize their operation if the InPlace is true and CanRunInPlace is true. Definition at line 108 of file itkInPlaceImageFilter.h. Give the process object a chance to indictate that it will produce more output than it was requested to produce. For example, many imaging filters must compute the entire output at once or can only produce output in complete slices. Such filters cannot handle smaller requested regions. These filters must provide an implementation of this method, setting the output requested region to the size they will produce. By default, a process object does not modify the size of the output requested region. Reimplemented in itk::CurvatureFlowImageFilter< TInputImage, TOutputImage >, itk::ExtensionVelocitiesImageFilter< TLevelSet, TAuxValue, VAuxDimension >, itk::FastMarchingExtensionImageFilter< TLevelSet, TAuxValue, VAuxDimension, TSpeedImage >, itk::FastMarchingImageFilter< TLevelSet, TSpeedImage >, itk::FFTRealToComplexConjugateImageFilter< TPixel, Dimension >, itk::ImagePCAShapeModelEstimator< TInputImage, TOutputImage >, itk::IsoContourDistanceImageFilter< TInputImage, TOutputImage >, itk::IsolatedWatershedImageFilter< TInputImage, TOutputImage >, itk::KLMRegionGrowImageFilter< TInputImage, TOutputImage >, itk::MRFImageFilter< TInputImage, TClassifiedImage >, itk::MultiResolutionPDEDeformableRegistration< TFixedImage, TMovingImage, TDeformationField, TRealType >, itk::ReinitializeLevelSetImageFilter< TLevelSet >, itk::VoronoiSegmentationImageFilterBase< TInputImage, TOutputImage, TBinaryPriorImage >, itk::WatershedImageFilter< TInputImage >, itk::BlackTopHatImageFilter< TInputImage, TOutputImage, TKernel >, itk::BSplineDecompositionImageFilter< TInputImage, TOutputImage >, itk::ClosingByReconstructionImageFilter< TInputImage, TOutputImage, TKernel >, itk::ConfidenceConnectedImageFilter< TInputImage, TOutputImage >, itk::ConnectedComponentImageFilter< TInputImage, TOutputImage, TMaskImage >, itk::ConnectedThresholdImageFilter< TInputImage, TOutputImage >, itk::ContourDirectedMeanDistanceImageFilter< TInputImage1, TInputImage2 >, itk::ContourMeanDistanceImageFilter< TInputImage1, TInputImage2 >, itk::DirectedHausdorffDistanceImageFilter< TInputImage1, TInputImage2 >, itk::DoubleThresholdImageFilter< TInputImage, TOutputImage >, itk::ExtractOrthogonalSwath2DImageFilter< TImage >, itk::GradientMagnitudeRecursiveGaussianImageFilter< TInputImage, TOutputImage >, itk::GradientRecursiveGaussianImageFilter< TInputImage, TOutputImage >, itk::GrayscaleConnectedClosingImageFilter< TInputImage, TOutputImage >, itk::GrayscaleConnectedOpeningImageFilter< TInputImage, TOutputImage >, itk::GrayscaleFillholeImageFilter< TInputImage, TOutputImage >, itk::GrayscaleGeodesicDilateImageFilter< TInputImage, TOutputImage >, itk::GrayscaleGeodesicErodeImageFilter< TInputImage, TOutputImage >, itk::GrayscaleGrindPeakImageFilter< TInputImage, TOutputImage >, itk::GrayscaleMorphologicalClosingImageFilter< TInputImage, TOutputImage, TKernel >, itk::GrayscaleMorphologicalOpeningImageFilter< TInputImage, TOutputImage, TKernel >, itk::HausdorffDistanceImageFilter< TInputImage1, TInputImage2 >, itk::HConcaveImageFilter< TInputImage, TOutputImage >, itk::HConvexImageFilter< TInputImage, TOutputImage >, itk::HessianRecursiveGaussianImageFilter< TInputImage, TOutputImage >, itk::HMaximaImageFilter< TInputImage, TOutputImage >, itk::HMinimaImageFilter< TInputImage, TOutputImage >, itk::HoughTransform2DCirclesImageFilter< TInputPixelType, TOutputPixelType >, itk::HoughTransform2DLinesImageFilter< TInputPixelType, TOutputPixelType >, itk::ImportImageFilter< TPixel, VImageDimension >, itk::IsolatedConnectedImageFilter< TInputImage, TOutputImage >, itk::LabelStatisticsImageFilter< TInputImage, TLabelImage >, itk::LaplacianRecursiveGaussianImageFilter< TInputImage, TOutputImage >, itk::MinimumMaximumImageFilter< TInputImage >, itk::NeighborhoodConnectedImageFilter< TInputImage, TOutputImage >, itk::OpeningByReconstructionImageFilter< TInputImage, TOutputImage, TKernel >, itk::OrientImageFilter< TInputImage, TOutputImage >, itk::ReconstructionImageFilter< TInputImage, TOutputImage, TCompare >, itk::RecursiveSeparableImageFilter< TInputImage, TOutputImage >, itk::RegionOfInterestImageFilter< TInputImage, TOutputImage >, itk::ShrinkImageFilter< TInputImage, TOutputImage >, itk::SimilarityIndexImageFilter< TInputImage1, TInputImage2 >, itk::SmoothingRecursiveGaussianImageFilter< TInputImage, TOutputImage >, itk::StatisticsImageFilter< TInputImage >, itk::TobogganImageFilter< TInputImage >, itk::VectorConfidenceConnectedImageFilter< TInputImage, TOutputImage >, itk::WhiteTopHatImageFilter< TInputImage, TOutputImage, TKernel >, itk::ImageFileReader< TOutputImage, ConvertPixelTraits >, itk::ImageSeriesReader< TOutputImage >, itk::MorphologicalWatershedFromMarkersImageFilter< TInputImage, TLabelImage >, itk::MorphologicalWatershedImageFilter< TInputImage, TOutputImage >, itk::RegionalMaximaImageFilter< TInputImage, TOutputImage >, itk::RegionalMinimaImageFilter< TInputImage, TOutputImage >, itk::SliceBySliceImageFilter< TInputImage, TOutputImage, TInputFilter, TOutputFilter, TInternalInputImage, TInternalOutputImage >, itk::ValuedRegionalExtremaImageFilter< TInputImage, TOutputImage, TFunction1, TFunction2 >, itk::VoronoiSegmentationImageFilterBase< TInputImage, TOutputImage >, itk::ReconstructionImageFilter< TInputImage, TOutputImage, std::greater< TOutputImage::PixelType > >, itk::ReconstructionImageFilter< TInputImage, TOutputImage, std::less< TOutputImage::PixelType > >, itk::ValuedRegionalExtremaImageFilter< TInputImage, TOutputImage, std::greater< TInputImage::PixelType >, std::greater< TOutputImage::PixelType > >, and itk::ValuedRegionalExtremaImageFilter< TInputImage, TOutputImage, std::less< TInputImage::PixelType >, std::less< TOutputImage::PixelType > >. Definition at line 225 of file itkProcessObject.h. A version of GenerateData() specific for image processing filters. This implementation will split the processing across multiple threads. The buffer is allocated by this method. Then the BeforeThreadedGenerateData() method is called (if provided). Then, a series of threads are spawned each calling ThreadedGenerateData(). After all the threads have completed processing, the AfterThreadedGenerateData() method is called (if provided). If an image processing filter cannot be threaded, the filter should provide an implementation of GenerateData(). That implementation is responsible for allocating the output buffer. If a filter an be threaded, it should NOT provide a GenerateData() method but should provide a ThreadedGenerateData() instead. Definition at line 106 of file itkCastImageFilter.h. What is the input requested region that is required to produce the output requested region? The base assumption for image processing filters is that the input requested region can be set to match the output requested region. If a filter requires more input (for instance a filter that uses neighborhoods needs more input than output to avoid introducing artificial boundary conditions) or less input (for instance a magnify filter) will have to override this method. In doing so, it should call its superclass' implementation as its first step. Note that imaging filters operate differently than the classes to this point in the class hierachy. Up till now, the base assumption has been that the largest possible region will be requested of the input. This implementation of GenerateInputRequestedRegion() only processes the inputs that are a subclass of the ImageBase<InputImageDimension>. If an input is another type of DataObject (including an Image of a different dimension), they are skipped by this method. The subclasses of ImageToImageFilter are responsible for providing an implementation of GenerateInputRequestedRegion() when there are multiple inputs of different types. Reimplemented in itk::CurvatureFlowImageFilter< TInputImage, TOutputImage >, itk::FFTComplexConjugateToRealImageFilter< TPixel, Dimension >, itk::FFTRealToComplexConjugateImageFilter< TPixel, Dimension >, itk::HistogramMatchingImageFilter< TInputImage, TOutputImage, THistogramMeasurement >, itk::ImagePCAShapeModelEstimator< TInputImage, TOutputImage >, itk::IsoContourDistanceImageFilter< TInputImage, TOutputImage >, itk::IsolatedWatershedImageFilter< TInputImage, TOutputImage >, itk::KLMRegionGrowImageFilter< TInputImage, TOutputImage >, itk::MRFImageFilter< TInputImage, TClassifiedImage >, itk::MultiResolutionPDEDeformableRegistration< TFixedImage, TMovingImage, TDeformationField, TRealType >, itk::MultiResolutionPyramidImageFilter< TInputImage, TOutputImage >, itk::OtsuMultipleThresholdsImageFilter< TInputImage, TOutputImage >, itk::OtsuThresholdImageFilter< TInputImage, TOutputImage >, itk::PDEDeformableRegistrationFilter< TFixedImage, TMovingImage, TDeformationField >, itk::RecursiveMultiResolutionPyramidImageFilter< TInputImage, TOutputImage >, itk::ReinitializeLevelSetImageFilter< TLevelSet >, itk::VoronoiSegmentationImageFilterBase< TInputImage, TOutputImage, TBinaryPriorImage >, itk::AccumulateImageFilter< TInputImage, TOutputImage >, itk::AdaptiveHistogramEqualizationImageFilter< TImageType >, itk::BilateralImageFilter< TInputImage, TOutputImage >, itk::BinaryMedianImageFilter< TInputImage, TOutputImage >, itk::BinaryMorphologyImageFilter< TInputImage, TOutputImage, TKernel >, itk::BinomialBlurImageFilter< TInputImage, TOutputImage >, itk::BlackTopHatImageFilter< TInputImage, TOutputImage, TKernel >, itk::BloxBoundaryPointToCoreAtomImageFilter< dim >, itk::BloxBoundaryProfileImageToBloxCoreAtomImageFilter< TInputImage, TOutputImage, TSourceImage >, itk::BSplineDecompositionImageFilter< TInputImage, TOutputImage >, itk::CannyEdgeDetectionImageFilter< TInputImage, TOutputImage >, itk::ChangeInformationImageFilter< TInputImage >, itk::ClosingByReconstructionImageFilter< TInputImage, TOutputImage, TKernel >, itk::ConfidenceConnectedImageFilter< TInputImage, TOutputImage >, itk::ConnectedComponentImageFilter< TInputImage, TOutputImage, TMaskImage >, itk::ConnectedThresholdImageFilter< TInputImage, TOutputImage >, itk::ContourDirectedMeanDistanceImageFilter< TInputImage1, TInputImage2 >, itk::ContourMeanDistanceImageFilter< TInputImage1, TInputImage2 >, itk::DerivativeImageFilter< TInputImage, TOutputImage >, itk::DirectedHausdorffDistanceImageFilter< TInputImage1, TInputImage2 >, itk::DiscreteGaussianImageFilter< TInputImage, TOutputImage >, itk::DisplacementFieldJacobianDeterminantFilter< TInputImage, TRealType, TOutputImage >, itk::DoubleThresholdImageFilter< TInputImage, TOutputImage >, itk::ExpandImageFilter< TInputImage, TOutputImage >, itk::ExtractOrthogonalSwath2DImageFilter< TImage >, itk::FlipImageFilter< TImage >, itk::GradientImageFilter< TInputImage, TOperatorValueType, TOutputValueType >, itk::GradientImageToBloxBoundaryPointImageFilter< TInputImage >, itk::GradientMagnitudeImageFilter< TInputImage, TOutputImage >, itk::GradientMagnitudeRecursiveGaussianImageFilter< TInputImage, TOutputImage >, itk::GradientRecursiveGaussianImageFilter< TInputImage, TOutputImage >, itk::GrayscaleConnectedClosingImageFilter< TInputImage, TOutputImage >, itk::GrayscaleConnectedOpeningImageFilter< TInputImage, TOutputImage >, itk::GrayscaleFillholeImageFilter< TInputImage, TOutputImage >, itk::GrayscaleGeodesicDilateImageFilter< TInputImage, TOutputImage >, itk::GrayscaleGeodesicErodeImageFilter< TInputImage, TOutputImage >, itk::GrayscaleGrindPeakImageFilter< TInputImage, TOutputImage >, itk::GrayscaleMorphologicalClosingImageFilter< TInputImage, TOutputImage, TKernel >, itk::GrayscaleMorphologicalOpeningImageFilter< TInputImage, TOutputImage, TKernel >, itk::HausdorffDistanceImageFilter< TInputImage1, TInputImage2 >, itk::HConcaveImageFilter< TInputImage, TOutputImage >, itk::HConvexImageFilter< TInputImage, TOutputImage >, itk::HessianRecursiveGaussianImageFilter< TInputImage, TOutputImage >, itk::HMaximaImageFilter< TInputImage, TOutputImage >, itk::HMinimaImageFilter< TInputImage, TOutputImage >, itk::HoughTransform2DCirclesImageFilter< TInputPixelType, TOutputPixelType >, itk::HoughTransform2DLinesImageFilter< TInputPixelType, TOutputPixelType >, itk::InterpolateImagePointsFilter< TInputImage, TOutputImage, TCoordType, InterpolatorType >, itk::InverseDeformationFieldImageFilter< TInputImage, TOutputImage >, itk::IsolatedConnectedImageFilter< TInputImage, TOutputImage >, itk::JoinSeriesImageFilter< TInputImage, TOutputImage >, itk::LabelStatisticsImageFilter< TInputImage, TLabelImage >, itk::LaplacianImageFilter< TInputImage, TOutputImage >, itk::LaplacianRecursiveGaussianImageFilter< TInputImage, TOutputImage >, itk::LaplacianSharpeningImageFilter< TInputImage, TOutputImage >, itk::MaskNeighborhoodOperatorImageFilter< TInputImage, TMaskImage, TOutputImage, TOperatorValueType >, itk::MeanImageFilter< TInputImage, TOutputImage >, itk::MedianImageFilter< TInputImage, TOutputImage >, itk::MinimumMaximumImageFilter< TInputImage >, itk::MirrorPadImageFilter< TInputImage, TOutputImage >, itk::MorphologicalGradientImageFilter< TInputImage, TOutputImage, TKernel >, itk::MorphologyImageFilter< TInputImage, TOutputImage, TKernel >, itk::NeighborhoodConnectedImageFilter< TInputImage, TOutputImage >, itk::NeighborhoodOperatorImageFilter< TInputImage, TOutputImage, TOperatorValueType >, itk::NoiseImageFilter< TInputImage, TOutputImage >, itk::NonThreadedShrinkImageFilter< TInputImage, TOutputImage >, itk::NormalizedCorrelationImageFilter< TInputImage, TMaskImage, TOutputImage, TOperatorValueType >, itk::NormalizeImageFilter< TInputImage, TOutputImage >, itk::ObjectMorphologyImageFilter< TInputImage, TOutputImage, TKernel >, itk::OpeningByReconstructionImageFilter< TInputImage, TOutputImage, TKernel >, itk::OrientImageFilter< TInputImage, TOutputImage >, itk::PadImageFilter< TInputImage, TOutputImage >, itk::PasteImageFilter< TInputImage, TSourceImage, TOutputImage >, itk::PermuteAxesImageFilter< TImage >, itk::ProjectionImageFilter< TInputImage, TOutputImage, TAccumulator >, itk::ReconstructionImageFilter< TInputImage, TOutputImage, TCompare >, itk::RecursiveSeparableImageFilter< TInputImage, TOutputImage >, itk::RegionOfInterestImageFilter< TInputImage, TOutputImage >, itk::RelabelComponentImageFilter< TInputImage, TOutputImage >, itk::ResampleImageFilter< TInputImage, TOutputImage, TInterpolatorPrecisionType >, itk::ShrinkImageFilter< TInputImage, TOutputImage >, itk::SimilarityIndexImageFilter< TInputImage1, TInputImage2 >, itk::SimpleContourExtractorImageFilter< TInputImage, TOutputImage >, itk::SmoothingRecursiveGaussianImageFilter< TInputImage, TOutputImage >, itk::SobelEdgeDetectionImageFilter< TInputImage, TOutputImage >, itk::StatisticsImageFilter< TInputImage >, itk::TileImageFilter< TInputImage, TOutputImage >, itk::TobogganImageFilter< TInputImage >, itk::VectorConfidenceConnectedImageFilter< TInputImage, TOutputImage >, itk::VectorExpandImageFilter< TInputImage, TOutputImage >, itk::VectorGradientMagnitudeImageFilter< TInputImage, TRealType, TOutputImage >, itk::VectorNeighborhoodOperatorImageFilter< TInputImage, TOutputImage >, itk::VectorResampleImageFilter< TInputImage, TOutputImage, TInterpolatorPrecisionType >, itk::VotingBinaryImageFilter< TInputImage, TOutputImage >, itk::WarpImageFilter< TInputImage, TOutputImage, TDeformationField >, itk::WarpVectorImageFilter< TInputImage, TOutputImage, TDeformationField >, itk::WhiteTopHatImageFilter< TInputImage, TOutputImage, TKernel >, itk::WrapPadImageFilter< TInputImage, TOutputImage >, itk::ZeroCrossingImageFilter< TInputImage, TOutputImage >, itk::FiniteDifferenceImageFilter< TInputImage, TOutputImage >, itk::AnchorErodeDilateImageFilter< TImage, TKernel, TFunction1, TFunction2 >, itk::AnchorOpenCloseImageFilter< TImage, TKernel, LessThan, GreaterThan, LessEqual, GreaterEqual >, itk::BinaryMorphologicalClosingImageFilter< TInputImage, TOutputImage, TKernel >, itk::BinaryMorphologicalOpeningImageFilter< TInputImage, TOutputImage, TKernel >, itk::BoxImageFilter< TInputImage, TOutputImage >, itk::DiscreteGaussianDerivativeImageFilter< TInputImage, TOutputImage >, itk::FFTComplexToComplexImageFilter< TPixel, NDimension >, itk::KappaSigmaThresholdImageFilter< TInputImage, TMaskImage, TOutputImage >, itk::MorphologicalWatershedFromMarkersImageFilter< TInputImage, TLabelImage >, itk::MorphologicalWatershedImageFilter< TInputImage, TOutputImage >, itk::ResampleImageFilter< TInputImage, TOutputImage, TInterpolatorPrecisionType >, itk::RegionalMaximaImageFilter< TInputImage, TOutputImage >, itk::RegionalMinimaImageFilter< TInputImage, TOutputImage >, itk::SliceBySliceImageFilter< TInputImage, TOutputImage, TInputFilter, TOutputFilter, TInternalInputImage, TInternalOutputImage >, itk::ValuedRegionalExtremaImageFilter< TInputImage, TOutputImage, TFunction1, TFunction2 >, itk::VanHerkGilWermanErodeDilateImageFilter< TImage, TKernel, TFunction1 >, itk::VoronoiSegmentationImageFilterBase< TInputImage, TOutputImage >, itk::CannyEdgeDetectionImageFilter< Superclass::ImageType, Superclass::ImageType >, itk::ProjectionImageFilter< TInputImage, TOutputImage, itk::Function::MedianAccumulator< TInputImage::PixelType > >, itk::ProjectionImageFilter< TInputImage, TOutputImage, itk::Function::MaximumAccumulator< TInputImage::PixelType > >, itk::ProjectionImageFilter< TInputImage, TOutputImage, itk::Function::BinaryThresholdAccumulator< TInputImage::PixelType, TOutputImage::PixelType > >, itk::ProjectionImageFilter< TInputImage, TOutputImage, itk::Function::MinimumAccumulator< TInputImage::PixelType > >, itk::ProjectionImageFilter< TInputImage, TOutputImage, itk::Function::MeanAccumulator< TInputImage::PixelType, TAccumulate > >, itk::ProjectionImageFilter< TInputImage, TOutputImage, itk::Function::StandardDeviationAccumulator< TInputImage::PixelType, TAccumulate > >, itk::ProjectionImageFilter< TInputImage, TOutputImage, itk::Function::SumAccumulator< TInputImage::PixelType, TOutputImage::PixelType > >, itk::ProjectionImageFilter< TInputImage, TOutputImage, itk::Function::BinaryAccumulator< TInputImage::PixelType, TOutputImage::PixelType > >, itk::ReconstructionImageFilter< TInputImage, TOutputImage, std::greater< TOutputImage::PixelType > >, itk::ReconstructionImageFilter< TInputImage, TOutputImage, std::less< TOutputImage::PixelType > >, itk::FiniteDifferenceImageFilter< TDeformationField, TDeformationField >, itk::FiniteDifferenceImageFilter< TInputImage, TSparseOutputImage >, itk::FiniteDifferenceImageFilter< TInputImage, itk::Image< TOutputPixelType,::itk::GetImageDimension< TInputImage >::ImageDimension > >, itk::FiniteDifferenceImageFilter< TInputImageType, TSparseOutputImageType >, itk::AnchorErodeDilateImageFilter< TImage, TKernel, std::less< TImage::TImage::PixelType >, std::less_equal< TImage::TImage::PixelType > >, itk::AnchorErodeDilateImageFilter< TImage, TKernel, std::greater< TImage::TImage::PixelType >, std::greater_equal< TImage::TImage::PixelType > >, itk::AnchorOpenCloseImageFilter< TImage, TKernel, std::greater< TImage::PixelType >, std::less< TImage::PixelType >, std::greater_equal< TImage::PixelType >, std::less_equal< TImage::PixelType > >, itk::AnchorOpenCloseImageFilter< TImage, TKernel, std::less< TImage::PixelType >, std::greater< TImage::PixelType >, std::less_equal< TImage::PixelType >, std::greater_equal< TImage::PixelType > >, itk::BoxImageFilter< TImageType, TImageType >, itk::ValuedRegionalExtremaImageFilter< TInputImage, TOutputImage, std::greater< TInputImage::PixelType >, std::greater< TOutputImage::PixelType > >, itk::ValuedRegionalExtremaImageFilter< TInputImage, TOutputImage, std::less< TInputImage::PixelType >, std::less< TOutputImage::PixelType > >, itk::VanHerkGilWermanErodeDilateImageFilter< TImage, TKernel, itk::MinFunctor< TImage::PixelType > >, and itk::VanHerkGilWermanErodeDilateImageFilter< TImage, TKernel, itk::MaxFunctor< TImage::PixelType > >. UnaryFunctorImageFilter can produce an image which is a different resolution than its input image. As such, UnaryFunctorImageFilter needs to provide an implementation for GenerateOutputInformation() in order to inform the pipeline execution model. The original documentation of this method is below. Given one output whose requested region has been set, how should the requested regions for the remaining outputs of the process object be set? By default, all the outputs are set to the same requested region. If a filter needs to produce different requested regions for each output, for instance an image processing filter producing several outputs at different resolutions, then that filter may override this method and set the requested regions appropriatedly. Note that a filter producing multiple outputs of different types is required to override this method. The default implementation can only correctly handle multiple outputs of the same type. Reimplemented in itk::MultiResolutionPyramidImageFilter< TInputImage, TOutputImage >, itk::RecursiveMultiResolutionPyramidImageFilter< TInputImage, TOutputImage >, itk::watershed::BoundaryResolver< TPixelType, TDimension >, itk::watershed::EquivalenceRelabeler< TScalarType, TImageDimension >, itk::watershed::Relabeler< TScalarType, TImageDimension >, itk::watershed::Segmenter< TInputImage >, itk::watershed::SegmentTreeGenerator< TScalarType >, itk::watershed::Relabeler< InputImageType::PixelType, itkGetStaticConstMacro(ImageDimension)>, and itk::watershed::SegmentTreeGenerator< InputImageType::PixelType >. Definition at line 76 of file itkUnaryFunctorImageFilter.h. Definition at line 75 of file itkUnaryFunctorImageFilter.h. Method used internally for getting an input. Return an array with all the inputs of this process object. This is useful for tracing back in the pipeline to construct graphs etc. Definition at line 108 of file itkProcessObject.h. Return the multithreader used by this class. Definition at line 284 of file itkProcessObject.h. Get the size of the input vector. This is merely the size of the input vector, not the number of inputs that have valid DataObject's assigned. Use GetNumberOfValidRequiredInputs() to determine how many inputs are non-null. Definition at line 118 of file itkProcessObject.h. Definition at line 135 of file itkProcessObject.h. Get the number of valid inputs. This is the number of non-null entries in the input vector in the first NumberOfRequiredInputs slots. This method is used to determine whether the necessary required inputs have been set. Subclasses of ProcessObject may override this implementation if the required inputs are not the first slots in input vector. Reimplemented in itk::MultiResolutionPDEDeformableRegistration< TFixedImage, TMovingImage, TDeformationField, TRealType >, and itk::PDEDeformableRegistrationFilter< TFixedImage, TMovingImage, TDeformationField >. Method used internally for getting an output. Get the output data of this process object. The output of this function is not valid until an appropriate Update() method has been called, either explicitly or implicitly. Both the filter itself and the data object have Update() methods, and both methods update the data. Here are three ways to use GetOutput() and make sure the data is valid. In these examples, image is a pointer to some Image object, and the particular ProcessObjects involved are filters. The same examples apply to non-image (e.g. Mesh) data as well. In this situation, someFilter and anotherFilter are said to constitute a pipeline. Note that Update() is not called automatically except within a pipeline as in the first example. When streaming (using a StreamingImageFilter) is activated, it may be more efficient to use a pipeline than to call Update() once for each filter in turn. For an image, the data generated is for the requested Region, which can be set using ImageBase::SetRequestedRegion(). By default, the largest possible region is requested. Return an array with all the outputs of this process object. This is useful for tracing forward in the pipeline to contruct graphs etc. Definition at line 133 of file itkProcessObject.h. Get the execution progress of a process object. The progress is a floating number in [0,1] with 0 meaning no progress and 1 meaning the filter has completed execution. Graft the specified data object onto this ProcessObject's idx'th output. This is similar to the GraftOutput method except it allows you to specify which output is affected. The specified index must be a valid output number (less than ProcessObject::GetNumberOfOutputs()). See the GraftOutput for general usage information. // graft the mini-pipeline output back onto this filter's output. // this is needed to get the appropriate regions passed back. For proper pipeline execution, a filter using a mini-pipeline must implement the GenerateInputRequestedRegion(), GenerateOutputRequestedRegion(), GenerateOutputInformation() and EnlargeOutputRequestedRegion() methods as necessary to reflect how the mini-pipeline will execute (in other words, the outer filter's pipeline mechanism must be consistent with what the mini-pipeline will do). Reimplemented in itk::BinaryFunctorImageFilter< TInputImage1, TInputImage2, TOutputImage, TFunction >, itk::NaryFunctorImageFilter< TInputImage, TOutputImage, TFunction >, itk::PasteImageFilter< TInputImage, TSourceImage, TOutputImage >, itk::TernaryFunctorImageFilter< TInputImage1, TInputImage2, TInputImage3, TOutputImage, TFunction >, itk::BinaryFunctorImageFilter< TInputImage1, TInputImage2, TOutputImage, itk::Function::Sub2< TInputImage1::PixelType, TInputImage2::PixelType, TOutputImage::PixelType > >, itk::BinaryFunctorImageFilter< TInputImage1, TInputImage2, TOutputImage, itk::Functor::Atan2< TInputImage1::PixelType, TInputImage2::PixelType, TOutputImage::PixelType > >, itk::BinaryFunctorImageFilter< TInputImage1, TInputImage2, TOutputImage, itk::Functor::AND< TInputImage1::PixelType, TInputImage2::PixelType, TOutputImage::PixelType > >, itk::BinaryFunctorImageFilter< TInputImage1, TInputImage2, TOutputImage, itk::Function::Maximum< TInputImage1::PixelType, TInputImage2::PixelType, TOutputImage::PixelType > >, itk::BinaryFunctorImageFilter< TInputImage1, TInputImage2, TOutputImage, itk::Functor::ConstrainedValueDifference< TInputImage1::PixelType, TInputImage2::PixelType, TOutputImage::PixelType > >, itk::BinaryFunctorImageFilter< TInputImage, TLabelImage, TOutputImage, itk::Functor::LabelOverlayFunctor< TInputImage::PixelType, TLabelImage::PixelType, TOutputImage::PixelType > >, itk::BinaryFunctorImageFilter< TInputImage1, TInputImage2, TOutputImage, itk::Functor::SquaredDifference2< TInputImage1::PixelType, TInputImage2::PixelType, TOutputImage::PixelType > >, itk::BinaryFunctorImageFilter< TInputImage, TInputImage, TOutputImage, itk::Function::Compose2DCovariantVector< TInputImage::PixelType > >, itk::BinaryFunctorImageFilter< TInputImage1, TInputImage2, TOutputImage, itk::Functor::Add2< TInputImage1::PixelType, TInputImage2::PixelType, TOutputImage::PixelType > >, itk::BinaryFunctorImageFilter< TInputImage, TInputImage, TOutputImage, itk::Function::Compose2DVector< TInputImage::PixelType > >, itk::BinaryFunctorImageFilter< TInputImage, TMaskImage, TOutputImage, itk::Functor::MaskInput< TInputImage::PixelType, TMaskImage::PixelType, TOutputImage::PixelType > >, itk::BinaryFunctorImageFilter< TInputImage1, TInputImage2, TOutputImage, itk::Functor::AbsoluteValueDifference2< TInputImage1::PixelType, TInputImage2::PixelType, TOutputImage::PixelType > >, itk::BinaryFunctorImageFilter< TInputImage1, TInputImage2, TOutputImage, itk::Functor::XOR< TInputImage1::PixelType, TInputImage2::PixelType, TOutputImage::PixelType > >, itk::BinaryFunctorImageFilter< TInputImage1, TInputImage2, TOutputImage, itk::Function::Minimum< TInputImage1::PixelType, TInputImage2::PixelType, TOutputImage::PixelType > >, itk::BinaryFunctorImageFilter< TInputImage, TMaskImage, TOutputImage, itk::Functor::MaskNegatedInput< TInputImage::PixelType, TMaskImage::PixelType, TOutputImage::PixelType > >, itk::BinaryFunctorImageFilter< TInputImage1, TInputImage2, TOutputImage, itk::Functor::Modulus2< TInputImage1::PixelType, TInputImage2::PixelType, TOutputImage::PixelType > >, itk::BinaryFunctorImageFilter< TInputImage1, TInputImage2, TOutputImage, itk::Functor::OR< TInputImage1::PixelType, TInputImage2::PixelType, TOutputImage::PixelType > >, itk::BinaryFunctorImageFilter< TInputImage1, TInputImage2, TOutputImage, itk::Functor::ConstrainedValueAddition< TInputImage1::PixelType, TInputImage2::PixelType, TOutputImage::PixelType > >, itk::BinaryFunctorImageFilter< TInputImage1, TInputImage2, TOutputImage, itk::Functor::WeightedAdd2< TInputImage1::PixelType, TInputImage2::PixelType, TOutputImage::PixelType > >, itk::BinaryFunctorImageFilter< TInputImage1, TInputImage2, TOutputImage, itk::Function::Div< TInputImage1::PixelType, TInputImage2::PixelType, TOutputImage::PixelType > >, itk::BinaryFunctorImageFilter< TInputImage1, TInputImage2, TOutputImage, itk::Function::Mult< TInputImage1::PixelType, TInputImage2::PixelType, TOutputImage::PixelType > >, itk::NaryFunctorImageFilter< TInputImage, TOutputImage, itk::Functor::Add1< TInputImage::PixelType, TInputImage::PixelType > >, itk::NaryFunctorImageFilter< TInputImage, TOutputImage, itk::Functor::Maximum1< TInputImage::PixelType, TInputImage::PixelType > >, itk::NaryFunctorImageFilter< TInputImage, TOutputImage, itk::Functor::ComposeRGBA< TInputImage::PixelType > >, itk::TernaryFunctorImageFilter< TInputImage, TInputImage, TInputImage, TOutputImage, itk::Function::Compose3DVector< TInputImage::PixelType > >, itk::TernaryFunctorImageFilter< TInputImage1, TInputImage2, TInputImage3, TOutputImage, itk::Function::Modulus3< TInputImage1::PixelType, TInputImage2::PixelType, TInputImage3::PixelType, TOutputImage::PixelType > >, itk::TernaryFunctorImageFilter< TInputImage1, TInputImage2, TInputImage3, TOutputImage, itk::Function::ModulusSquare3< TInputImage1::PixelType, TInputImage2::PixelType, TInputImage3::PixelType, TOutputImage::PixelType > >, itk::TernaryFunctorImageFilter< TInputImage1, TInputImage2, TInputImage3, TOutputImage, itk::Function::Add3< TInputImage1::PixelType, TInputImage2::PixelType, TInputImage3::PixelType, TOutputImage::PixelType > >, itk::TernaryFunctorImageFilter< TInputImage, TInputImage, TInputImage, TOutputImage, itk::Function::Compose3DCovariantVector< TInputImage::PixelType > >, and itk::TernaryFunctorImageFilter< TInputImage, TInputImage, TInputImage, TOutputImage, itk::Function::ComposeRGB< TInputImage::PixelType > >. Reimplemented in itk::SegmentationLevelSetImageFilter< TInputImage, TFeatureImage, TOutputPixelType >, itk::NaryFunctorImageFilter< TInputImage, TOutputImage, TFunction >, itk::PasteImageFilter< TInputImage, TSourceImage, TOutputImage >, itk::RelabelComponentImageFilter< TInputImage, TOutputImage >, itk::NaryFunctorImageFilter< TInputImage, TOutputImage, itk::Functor::Add1< TInputImage::PixelType, TInputImage::PixelType > >, itk::NaryFunctorImageFilter< TInputImage, TOutputImage, itk::Functor::Maximum1< TInputImage::PixelType, TInputImage::PixelType > >, and itk::NaryFunctorImageFilter< TInputImage, TOutputImage, itk::Functor::ComposeRGBA< TInputImage::PixelType > >. Make a DataObject of the correct type to used as the specified output. Every ProcessObject subclass must be able to create a DataObject that can be used as a specified output. This method is automatically called when DataObject::DisconnectPipeline() is called. DataObject::DisconnectPipeline, disconnects a data object from being an output of its current source. When the data object is disconnected, the ProcessObject needs to construct a replacement output data object so that the ProcessObject is in a valid state. So DataObject::DisconnectPipeline eventually calls ProcessObject::MakeOutput. Note that MakeOutput always returns a SmartPointer to a DataObject. If a subclass of ImageSource has multiple outputs of different types, then that class must provide an implementation of MakeOutput(). Reimplemented in itk::EigenAnalysis2DImageFilter< TInputImage, TEigenValueImage, TEigenVectorImage >, itk::MinimumMaximumImageFilter< TInputImage >, itk::StatisticsImageFilter< TInputImage >, itk::MaskedMovingHistogramImageFilter< TInputImage, TMaskImage, TOutputImage, TKernel, THistogram >, and itk::MaskedMovingHistogramImageFilter< TInputImage, TMaskImage, TOutputImage, TKernel, itk::MaskedRankHistogram< TInputImage::PixelType > >. An opportunity to deallocate a ProcessObject's bulk data storage. Some filters may wish to reuse existing bulk data storage to avoid unnecessary deallocation/allocation sequences. The default implementation calls Initialize() on each output. DataObject::Initialize() frees its bulk data by default. Reimplemented in itk::WatershedImageFilter< TInputImage >. Reimplemented in itk::AnisotropicFourthOrderLevelSetImageFilter< TInputImage, TOutputImage >, itk::AntiAliasBinaryImageFilter< TInputImage, TOutputImage >, itk::BinaryMinMaxCurvatureFlowImageFilter< TInputImage, TOutputImage >, itk::CurvatureFlowImageFilter< TInputImage, TOutputImage >, itk::CurvesLevelSetImageFilter< TInputImage, TFeatureImage, TOutputPixelType >, itk::DemonsRegistrationFilter< TFixedImage, TMovingImage, TDeformationField >, itk::GeodesicActiveContourLevelSetImageFilter< TInputImage, TFeatureImage, TOutputPixelType >, itk::GeodesicActiveContourShapePriorLevelSetImageFilter< TInputImage, TFeatureImage, TOutputPixelType >, itk::IsotropicFourthOrderLevelSetImageFilter< TInputImage, TOutputImage >, itk::LaplacianSegmentationLevelSetImageFilter< TInputImage, TFeatureImage, TOutputPixelType >, itk::LevelSetMotionRegistrationFilter< TFixedImage, TMovingImage, TDeformationField >, itk::MinMaxCurvatureFlowImageFilter< TInputImage, TOutputImage >, itk::NarrowBandCurvesLevelSetImageFilter< TInputImage, TFeatureImage, TOutputPixelType >, itk::NarrowBandLevelSetImageFilter< TInputImage, TFeatureImage, TOutputPixelType, TOutputImage >, itk::NarrowBandThresholdSegmentationLevelSetImageFilter< TInputImage, TFeatureImage, TOutputPixelType >, itk::PDEDeformableRegistrationFilter< TFixedImage, TMovingImage, TDeformationField >, itk::SegmentationLevelSetImageFilter< TInputImage, TFeatureImage, TOutputPixelType >, itk::ShapeDetectionLevelSetImageFilter< TInputImage, TFeatureImage, TOutputPixelType >, itk::ShapePriorSegmentationLevelSetImageFilter< TInputImage, TFeatureImage, TOutputPixelType >, itk::SymmetricForcesDemonsRegistrationFilter< TFixedImage, TMovingImage, TDeformationField >, itk::ThresholdSegmentationLevelSetImageFilter< TInputImage, TFeatureImage, TOutputPixelType >, itk::UnsharpMaskLevelSetImageFilter< TInputImage, TOutputImage >, itk::VectorThresholdSegmentationLevelSetImageFilter< TInputImage, TFeatureImage, TOutputPixelType >, itk::AnisotropicDiffusionImageFilter< TInputImage, TOutputImage >, itk::BinaryThresholdImageFilter< TInputImage, TOutputImage >, itk::ChangeLabelImageFilter< TInputImage, TOutputImage >, itk::GradientMagnitudeRecursiveGaussianImageFilter< TInputImage, TOutputImage >, itk::ImplicitManifoldNormalVectorFilter< TInputImage, TSparseOutputImage >, itk::IntensityWindowingImageFilter< TInputImage, TOutputImage >, itk::InvertIntensityImageFilter< TInputImage, TOutputImage >, itk::MaskImageFilter< TInputImage, TMaskImage, TOutputImage >, itk::ModulusImageFilter< TInputImage, TOutputImage >, itk::NarrowBandImageFilterBase< TInputImage, TOutputImage >, itk::ParallelSparseFieldLevelSetImageFilter< TInputImage, TOutputImage >, itk::PasteImageFilter< TInputImage, TSourceImage, TOutputImage >, itk::RelabelComponentImageFilter< TInputImage, TOutputImage >, itk::RescaleIntensityImageFilter< TInputImage, TOutputImage >, itk::ShiftScaleInPlaceImageFilter< TInputImage >, itk::SparseFieldFourthOrderLevelSetImageFilter< TInputImage, TOutputImage >, itk::SparseFieldLevelSetImageFilter< TInputImage, TOutputImage >, itk::SymmetricEigenAnalysisImageFilter< TInputImage, TOutputImage >, itk::TensorFractionalAnisotropyImageFilter< TInputImage, TOutputImage >, itk::TensorRelativeAnisotropyImageFilter< TInputImage, TOutputImage >, itk::ThresholdImageFilter< TImage >, itk::ThresholdLabelerImageFilter< TInputImage, TOutputImage >, itk::VectorRescaleIntensityImageFilter< TInputImage, TOutputImage >, itk::DenseFiniteDifferenceImageFilter< TInputImage, TOutputImage >, itk::FiniteDifferenceImageFilter< TInputImage, TOutputImage >, itk::FiniteDifferenceSparseImageFilter< TInputImageType, TSparseOutputImageType >, itk::AddConstantToImageFilter< TInputImage, TConstant, TOutputImage >, itk::DiffeomorphicDemonsRegistrationFilter< TFixedImage, TMovingImage, TDeformationField >, itk::DivideByConstantImageFilter< TInputImage, TConstant, TOutputImage >, itk::FastSymmetricForcesDemonsRegistrationFilter< TFixedImage, TMovingImage, TDeformationField >, itk::LabelOverlayImageFilter< TInputImage, TLabelImage, TOutputImage >, itk::LabelToRGBImageFilter< TLabelImage, TOutputImage >, itk::MultiplyByConstantImageFilter< TInputImage, TConstant, TOutputImage >, itk::SubtractConstantFromImageFilter< TInputImage, TConstant, TOutputImage >, itk::NarrowBandLevelSetImageFilter< TInputImage, TFeatureImage, TOutputPixelType, itk::Image< TOutputPixelType,::itk::GetImageDimension< TInputImage >::ImageDimension > >, itk::NarrowBandImageFilterBase< TInputImage, itk::Image< TOutputPixelType,::itk::GetImageDimension< TInputImage >::ImageDimension > >, itk::SparseFieldLevelSetImageFilter< TInputImage, itk::Image< TOutputPixelType,::itk::GetImageDimension< TInputImage >::ImageDimension > >, itk::DenseFiniteDifferenceImageFilter< TDeformationField, TDeformationField >, itk::FiniteDifferenceImageFilter< TDeformationField, TDeformationField >, itk::FiniteDifferenceImageFilter< TInputImage, TSparseOutputImage >, itk::FiniteDifferenceImageFilter< TInputImage, itk::Image< TOutputPixelType,::itk::GetImageDimension< TInputImage >::ImageDimension > >, itk::FiniteDifferenceImageFilter< TInputImageType, TSparseOutputImageType >, and itk::FiniteDifferenceSparseImageFilter< TInputImage, TSparseOutputImage >. Send the requested region information back up the pipeline (to the filters that preceed this one). Reimplemented in itk::VTKImageImport< TOutputImage >. Propagate a call to ResetPipeline() up the pipeline. Called only from DataObject. PushBackInput(), PushFronInput() in the public section force the input to be the type expected by an ImageToImageFilter. However, these methods end of "hiding" the versions from the superclass (ProcessObject) whose arguments are DataObjects. Here, we re-expose the versions from ProcessObject to avoid warnings about hiding methods from the superclass. Definition at line 251 of file itkImageToImageFilter.h. Push/Pop the input of this process object. These methods allow a filter to model its input vector as a queue or stack. These routines may not be appropriate for all filters, especially filters with different types of inputs. These routines follow the semantics of STL. The routines are useful for applications that need to process "rolling" sets of images. For instance, if an application has 10 images and they need to run a filter on images 1, 2, 3, 4, then run the filter on images 2, 3, 4, 5, then run the filter on images 3, 4, 5, 6, the application can accomplish this by popping an input off the front of the input list and push a new image onto the back of input list. Again, this only makes sense for filters that single type of input. Other uses are also possible. For a single input filter, pushing and popping inputs allow the application to temporarily replace an input to a filter. Definition at line 253 of file itkImageToImageFilter.h. Definition at line 257 of file itkProcessObject.h. Definition at line 256 of file itkProcessObject.h. InPlaceImageFilter may transfer ownership of the input bulk data to the output object. Once the output object owns the bulk data (done in AllocateOutputs()), the input object must release its hold on the bulk data. ProcessObject::ReleaseInputs() only releases the input bulk data when the user has set the ReleaseDataFlag. InPlaceImageFilter::ReleaseInputs() also releases the input that it has overwritten. Reset the pipeline. If an exception is thrown during an Update(), the pipeline may be in an inconsistent state. This method clears the internal state of the pipeline so Update() can be called. Restore the cached input ReleaseDataFlags. Set the functor object. This replaces the current Functor with a copy of the specified Functor. This allows the user to specify a functor that has ivars set differently than the default functor. This method requires an operator!=() be defined on the functor (or the compiler's default implementation of operator!=() being appropriate). Definition at line 85 of file itkUnaryFunctorImageFilter.h. In place operation can be turned on and off. This only has an effect when the input and output image type match. Set/Get the image input of this process object. Protected methods for setting inputs. Subclasses make use of them for setting input. Referenced by itk::watershed::BoundaryResolver< TPixelType, TDimension >::SetBoundaryA(), itk::watershed::BoundaryResolver< TPixelType, TDimension >::SetBoundaryB(), itk::watershed::EquivalenceRelabeler< TScalarType, TImageDimension >::SetEquivalencyTable(), itk::SegmentationLevelSetImageFilter< TInputImage, TFeatureImage, TOutputPixelType >::SetFeatureImage(), itk::NarrowBandLevelSetImageFilter< TInputImage, TFeatureImage, TOutputPixelType, itk::Image< TOutputPixelType,::itk::GetImageDimension< TInputImage >::ImageDimension > >::SetFeatureImage(), itk::WatershedImageFilter< TInputImage >::SetInput(), itk::watershed::SegmentTreeGenerator< InputImageType::PixelType >::SetInputEquivalencyTable(), itk::watershed::Segmenter< TInputImage >::SetInputImage(), itk::watershed::Relabeler< InputImageType::PixelType, itkGetStaticConstMacro(ImageDimension)>::SetInputImage(), itk::watershed::EquivalenceRelabeler< TScalarType, TImageDimension >::SetInputImage(), itk::watershed::SegmentTreeGenerator< InputImageType::PixelType >::SetInputSegmentTable(), itk::watershed::Relabeler< InputImageType::PixelType, itkGetStaticConstMacro(ImageDimension)>::SetInputSegmentTree(), itk::DiffusionTensor3DReconstructionImageFilter< TReferenceImagePixelType, TGradientImagePixelType, TTensorPixelType >::SetReferenceImage(), and itk::ChangeInformationImageFilter< TInputImage >::SetReferenceImage(). Protected methods for setting outputs. Subclasses make use of them for getting output. Referenced by itk::watershed::BoundaryResolver< TPixelType, TDimension >::BoundaryResolver(), itk::watershed::EquivalenceRelabeler< TScalarType, TImageDimension >::EquivalenceRelabeler(), itk::watershed::Segmenter< TInputImage >::SetBoundary(), itk::watershed::BoundaryResolver< TPixelType, TDimension >::SetEquivalencyTable(), itk::watershed::Segmenter< TInputImage >::SetOutputImage(), itk::watershed::Relabeler< InputImageType::PixelType, itkGetStaticConstMacro(ImageDimension)>::SetOutputImage(), itk::watershed::EquivalenceRelabeler< TScalarType, TImageDimension >::SetOutputImage(), and itk::watershed::Segmenter< TInputImage >::SetSegmentTable(). Called to allocate the input array. Copies old inputs. Called to allocate the output array. Copies old outputs. Get/Set the number of threads to create when executing. 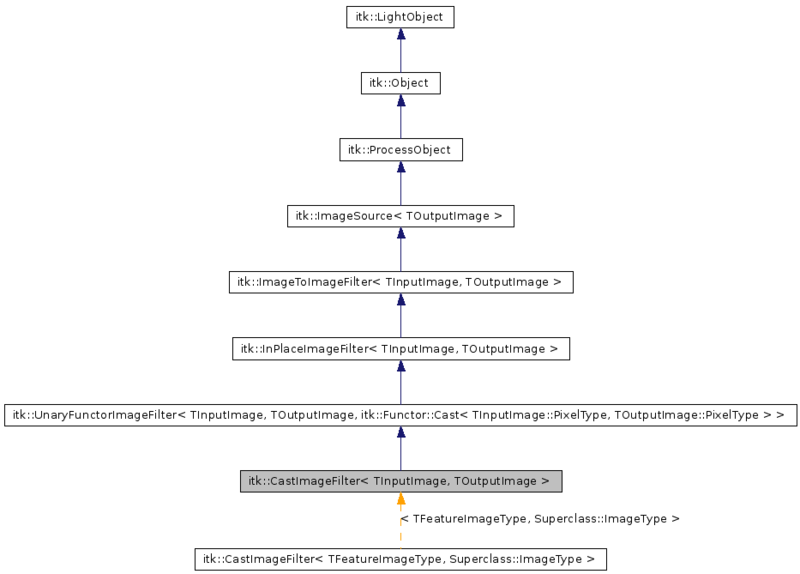 Reimplemented in itk::GradientMagnitudeRecursiveGaussianImageFilter< TInputImage, TOutputImage >, itk::SmoothingRecursiveGaussianImageFilter< TInputImage, TOutputImage >, itk::MiniPipelineSeparableImageFilter< TInputImage, TOutputImage, TFilter >, itk::GrayscaleDilateImageFilter< TInputImage, TOutputImage, TKernel >, itk::GrayscaleErodeImageFilter< TInputImage, TOutputImage, TKernel >, and itk::MiniPipelineSeparableImageFilter< TInputImage, TOutputImage, itk::RankImageFilter< TInputImage, TInputImage, itk::FlatStructuringElement< ::itk::GetImageDimension< TInputImage >::ImageDimension > > >. Set the execution progress of a process object. The progress is a floating number in [0,1] with 0 meaning no progress and 1 meaning the filter has completed execution. The ProgressEvent is NOT invoked. Turn on/off the flags to control whether the bulk data belonging to the outputs of this ProcessObject are released/reallocated during an Update(). In limited memory scenarios, a user may want to force the elements of a pipeline to release any bulk data that is going to be regenerated anyway during an Update() in order to control peak memory allocation. Note that this flag is different from the ReleaseDataFlag. ReleaseDataFlag manages the deallocation of a ProcessObject's bulk output data once that data has been consumed by a downstream ProcessObject. The ReleaseDataBeforeUpdateFlag manages the deallocation/reallocation of bulk data during a pipeline update to control peak memory utilization. Default value is on. Turn on/off the flags to control whether the bulk data belonging to the outputs of this ProcessObject are released after being used by a downstream ProcessObject. Default value is off. Another options for controlling memory utilization is the ReleaseDataBeforeUpdateFlag. Split the output's RequestedRegion into "num" pieces, returning region "i" as "splitRegion". This method is called "num" times. The regions must not overlap. The method returns the number of pieces that the routine is capable of splitting the output RequestedRegion, i.e. return value is less than or equal to "num". Reimplemented in itk::SignedMaurerDistanceMapImageFilter< TInputImage, TOutputImage >. UnaryFunctorImageFilter can be implemented as a multithreaded filter. Therefore, this implementation provides a ThreadedGenerateData() routine which is called for each processing thread. The output image data is allocated automatically by the superclass prior to calling ThreadedGenerateData(). ThreadedGenerateData can only write to the portion of the output image specified by the parameter "outputRegionForThread"
Static function used as a "callback" by the MultiThreader. The threading library will call this routine for each thread, which will delegate the control to ThreadedGenerateData(). Bring this filter up-to-date. Update() checks modified times against last execution times, and re-executes objects if necessary. A side effect of this method is that the whole pipeline may execute in order to bring this filter up-to-date. This method updates the currently prescribed requested region. If no requested region has been set on the output, then the requested region will be set to the largest possible region. Once the requested region is set, Update() will make sure the specified requested region is up-to-date. This is a confusing side effect to users who are just calling Update() on a filter. A first call to Update() will cause the largest possible region to be updated. A second call to Update() will update that same region. If a modification to the upstream pipeline cause a filter to have a different largest possible region, this second call to Update() will not cause the output requested region to be reset to the new largest possible region. Instead, the output requested region will be the same as the last time Update() was called. To have a filter always to produce its largest possible region, users should call UpdateLargestPossibleRegion() instead. Reimplemented in itk::CoreAtomImageToUnaryCorrespondenceMatrixProcess< TSourceImage >, itk::MedialNodePairCorrespondenceProcess< TSourceImage >, itk::MedialNodeTripletCorrespondenceProcess< TSourceImage >, itk::CoreAtomImageToDistanceMatrixProcess< TSourceImage >, itk::ImageFileWriter< TInputImage >, and itk::ImageSeriesWriter< TInputImage, TOutputImage >. Like Update(), but sets the output requested region to the largest possible region for the output. This is the method users should call if they want the entire dataset to be processed. If a user wants to update the same output region as a previous call to Update() or a previous call to UpdateLargestPossibleRegion(), then they should call the method Update(). Reimplemented in itk::StreamingImageFilter< TInputImage, TOutputImage >. Update the information decribing the output data. This method transverses up the pipeline gathering modified time information. On the way back down the pipeline, this method calls GenerateOutputInformation() to set any necessary information about the output data objects. For instance, a filter that shrinks an image will need to provide an implementation for GenerateOutputInformation() that changes the spacing of the pixels. Such filters should call their superclass' implementation of GenerateOutputInformation prior to changing the information values they need (i.e. GenerateOutputInformation() should call Superclass::GenerateOutputInformation() prior to changing the information. Reimplemented in itk::watershed::Segmenter< TInputImage >, and itk::VTKImageImport< TOutputImage >. Update the progress of the process object. Sets the Progress ivar to amount and invokes any observers for the ProgressEvent. The parameter amount should be in [0,1] and is the cumulative (not incremental) progress. Time when GenerateOutputInformation was last called. Definition at line 431 of file itkProcessObject.h. This flag indicates when the pipeline is executing. It prevents infinite recursion when pipelines have loops. Definition at line 428 of file itkProcessObject.h.